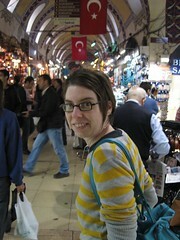 In the grand bazaar. Very overwhelming. we were on the lookout for turkish lamps, but they were much too expensive. we did find a great scarf vendor though. it did make us really cheap for scarve the rest fo the trip, though! if you've bought some for 3TL it's hard to pay 10.